I came across this book while shopping at Amazon.fr. The title is fairly blunt. It translates as "The PEPLUM a bad genre". Sounds like a riveting read. Seriously, the title says it all. There's no compelling need to read it and dig deeper inside the pages if the title just point blank declares the PEPLUM genre as being terrible in its title. I would read anything on the subject, and I can read in French but I won't be buying it. The title spoils it. Arf. Addendum: Michel Eloy replied (see comments) with an explanation for the title in that the word "mauvais" is used as "maudit" or in English, "cursed" or "damned" so the translation would be: "The Peplum a cursed genre" or "The Peplum a damned genre", which is better than "bad" and it does describe it as the genre is often derided as being useless and stupid, by critics and the public in general certainly because of the MST3K bunch, but I still sorta find it on the negative side. Underrated would be a better word to describe the genre. 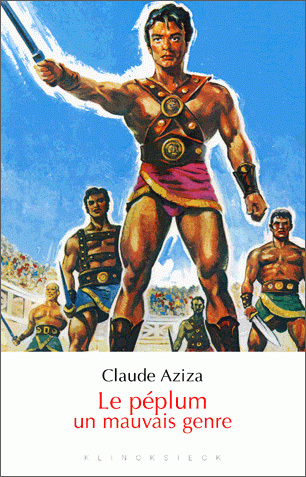 The author of the book, Claude Aziza, is a fan of Sword & Sandal films and wrote a couple of books on the subject, including this one which Michel reassures me that it's a positive one on the subject. Je croyais que ça soit quelque chose comme cela car j'ai lu des critiques sur le web qui disaient le livre du contraire de la façon que je l'apercevais mais pour moi le titre n'est pas très intéressant, ou pas très envoutant. Il me semble négatif. En anglais, je décris le Péplum sur mes sites (mon blog, youtube...) comme "underrated" ou sous-estimer pas mauvais ou maudit. Merci pour avoir mis les points sur les i.